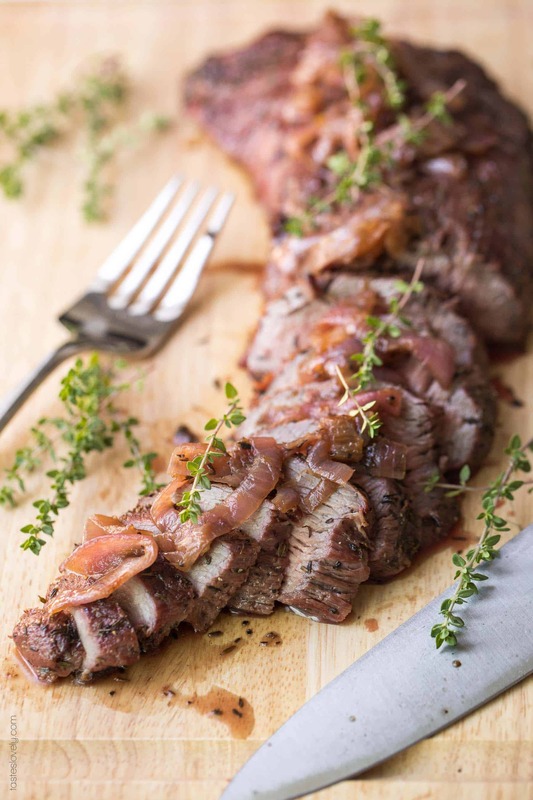 The BEST Paleo + Whole30 Tri Tip Steak Marinade Recipe – just 4 ingredients! Served with red wine vinegar sautéed red onions. Bright, flavorful and delicious. Gluten free, grain free, dairy free, refined sugar free, soy free, clean eating, real food. The pregnancy craving of red meat continues! This Paleo + Whole30 Tri Tip Steak Marinade is the absolute most satiating meal I have found to meet my red meat cravings. Although, my paleo + whole30 burgers and my paleo + whole30 meatballs are pretty heavy contenders too. 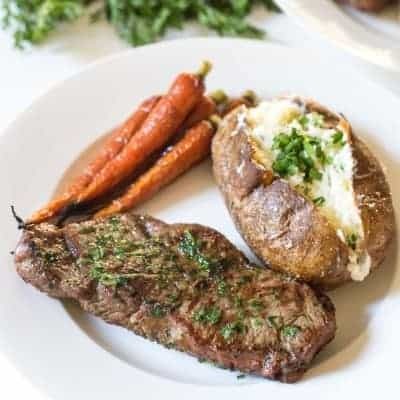 I love steak, and I especially love using a cut like tri tip since I can pack in tons of flavor in the marinade, it feeds all of us for a whole lot less than if I was serving us filet mignon, and it does great on the grill which adds even more flavor to it. 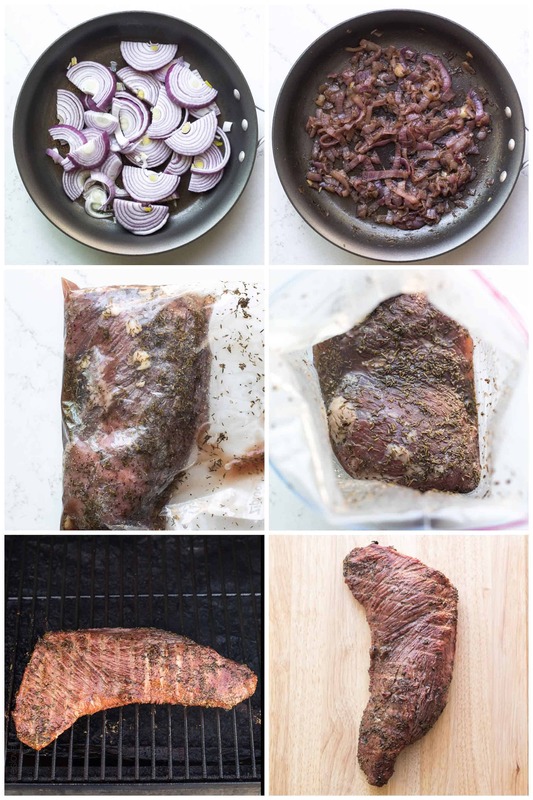 I played around with a paleo friendly tri tip marinade to find one that I loved. 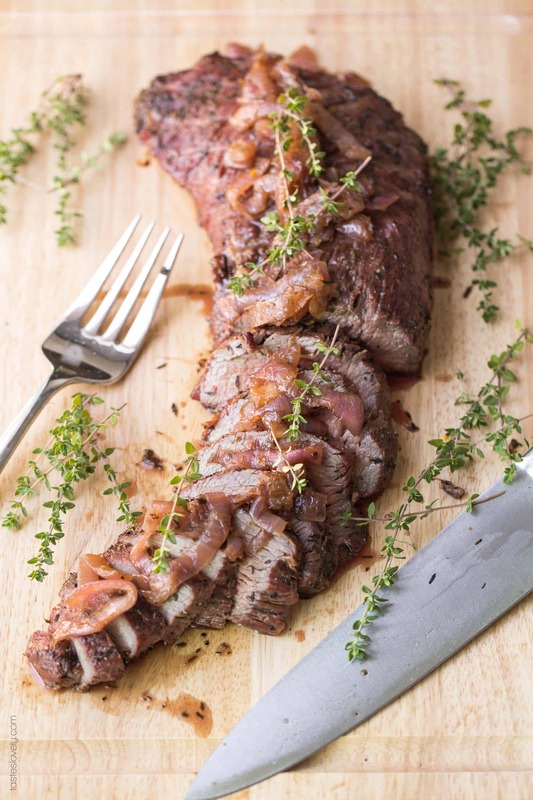 A ton of recipes I tried use red wine, but honestly I don’t like the flavor and texture red wine gives to the tri tip. It almost makes it grainy? And too earthy. I wanted something to make it brighter and add tons more flavor. Then I had a stroke of genius, what if I used red wine vinegar! 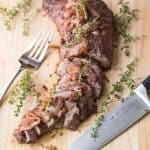 I added in a few other essential ingredients to get the flavor I was hoping for, and it was the BEST paleo +whole30 tri tip steak marinade I had ever! The umami flavor from the steak with the brightness of the red wine vinegar, sweetness from the honey, earthiness from the garlic and thyme. It is heavenly! The steak marinade is just 4 ingredients: red wine vinegar, honey (or substitute date paste for whole30), crushed garlic and dried thyme. And of course salt and pepper. So simple, and it is so delicious! Reminds me of the brightness you get from a great salad dressing. And the honey helps to get a great caramelized crust to the tri tip as it grills. I combine all the ingredients in a ziploc bag and marinate the tri tip for at least 1 hour, or up 2 days. The other important aspect of this marinade is the red wine vinegar sautéed red onions. I just love sautéed onions and steak! I sauté the red onions as I normally do, and at the very end of cooking add in some red wine vinegar, honey and thyme. 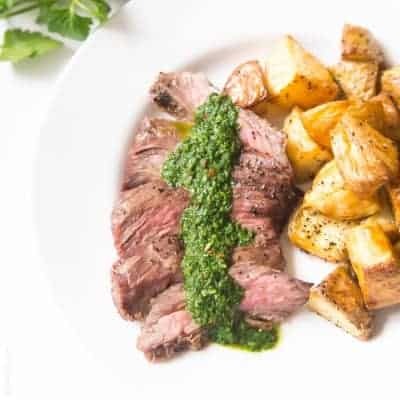 It mimics the tri tip marinade and adds even more flavor and juiciness to the steak when it’s served on top. Do not skip these! I have been loving this tri tip steak marinade so much, we’ve been making it once a week. Almost always on Friday as a special weekend kickoff dinner. I serve it with roasted potatoes and a roasted vegetable. Not only is it delicious, it’s so healthy! Paleo, whole30, gluten free, grain free, dairy free, soy free, refined sugar free, clean eating, real food. In your gallon ziploc bag, combine the red wine vinegar, honey, garlic, dried thyme, salt and pepper. Shake and squeeze it to mix the marinade. Add the tri tip roast, remove as much air as possible, and seal. 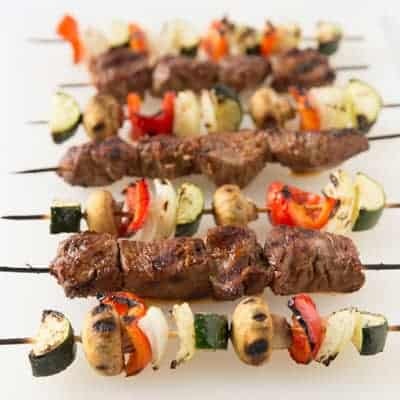 Marinate for at least 1 hour in the refrigerator, or up to 2 days. Preheat your grill (or indoor grill grates) over medium high heat. Remove the tri tip from the marinade, discard any remaining marinade in bag. Sprinkle the tri tip with about 1 teaspoon of salt, and grill the tri tip covered for 15 minutes. 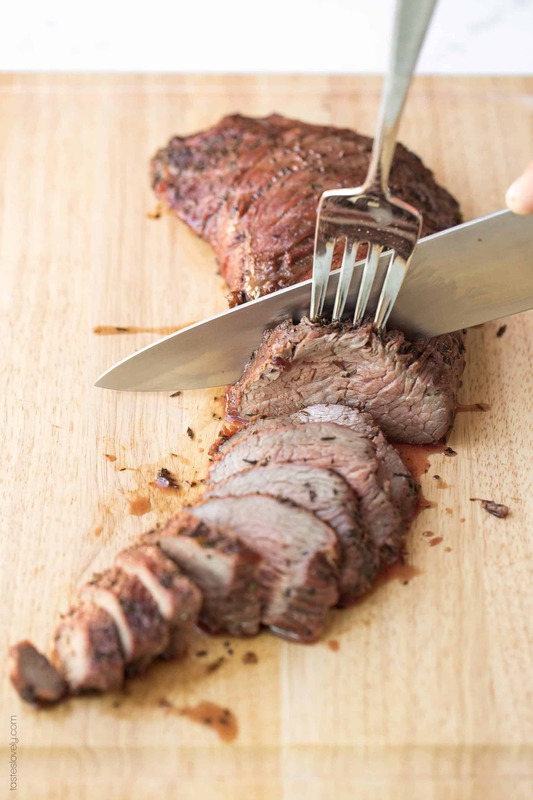 Flip and continue to cook until the tri tip has an internal temperature of 135ºF for medium rare (or 145ºF for medium), about 8-10 more minutes depending on the thickness of your tri tip. Remove the cooked tri tip from the grill and rest for 10 minutes. While the tri tip is cooking and resting, make the grilled onions. Heat a large skillet over medium heat. Add the olive oil, sliced onions, salt and pepper. Cook for about 30 minutes, stirring occasionally, until the onions are soft. If the pan ever gets too dry, or the onions start to get too charred, I add in 1/4 cup of water to keep everything juicy. The water will cook away. Add more water during the cooking process if needed. When the onions are softened, add in the 1 tablespoon of red wine vinegar, 1 teaspoon honey and 1 teaspoon of thyme. Stir to combine. Remove from heat. 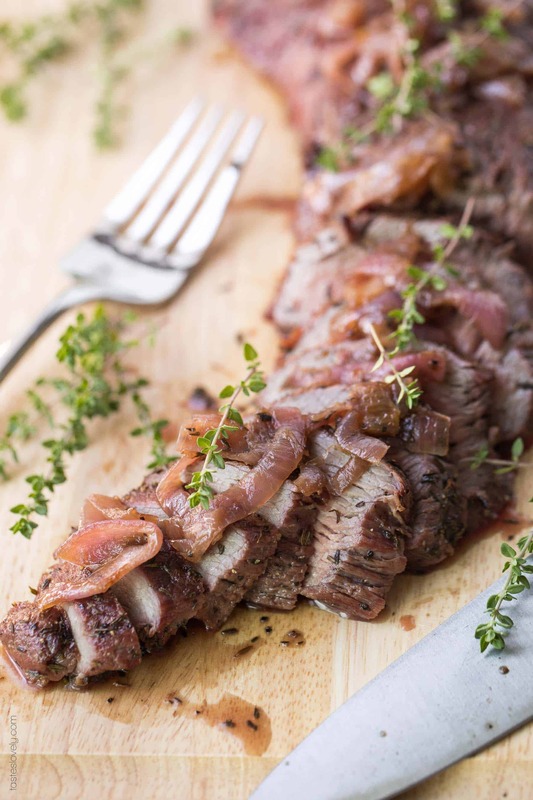 After the tri tip has rested, slice against the grain and serve topped with the grilled red onions. Leftovers will keep in an airtight container refrigerated for 5 days. I love steak and I’m always keen on learning new recipes. Think I’ll try this one out. You must try it! It is my favorite right now! My new favorite marinade! Most marinades are MSG bombs and give me migraines. This clean eating marinade is fabulous. We had some blue cheese crumbs that we sprinkled on top. The flavor was a delicious contrast to the red wine vinegar. I’m so glad you liked it Lisa! So delicious, and such clean ingredients. We’ve been making this tri tip once a week all summer long. Thanks for letting me know you liked my recipe, you made my day! Yes! I use olive oil. I would probably half this marinade amount if making for just 1 steak!